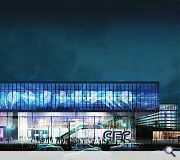 Scottish Events Campus have put forward an application for planning permission in principle to expand their current site Congress Road, Finnieston, on land bounded by the River Clyde and Clydeside Expressway. 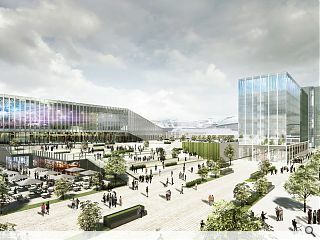 Indicative plans drawn up by Keppie Design and Arup call for an expansion and enhancement of existing facilities to create the ‘best event campus in Europe’ through addition of new event & conference facilities, an enhanced walkway to Exhibition Centre station and a 200-bed hotel adjacent to the Crowne Plaza. A detailed planning application is expected to be filed by summer 2020 with phased construction following over the next five years. Hope they take a brave pill and deliver on the scale that the site needs. That and a car park exit strategy that actually works. Needs to work with the development opportunities on the south bank plus properly link Finnieston and the railway station -- the red tunnel has to go. Should include a big push to double the hotel rooms in the area to boost the spend and encourage more associated development. The SEC(C) is no longer a cathedral in the desert -- more of a large parish church on the prairie. A cursory glance at these awkward images, in the sense of lack of orientated perspective & limited dimensionality, creates a sense of sprawl- which I suspect this site needs like a hole in the head- but the landscaping looks promising. Are there no plans for housing to be incorporated into the plan? How do we integrate the site more coherently into the wider urban fabric without a network of habitable dense settlements? 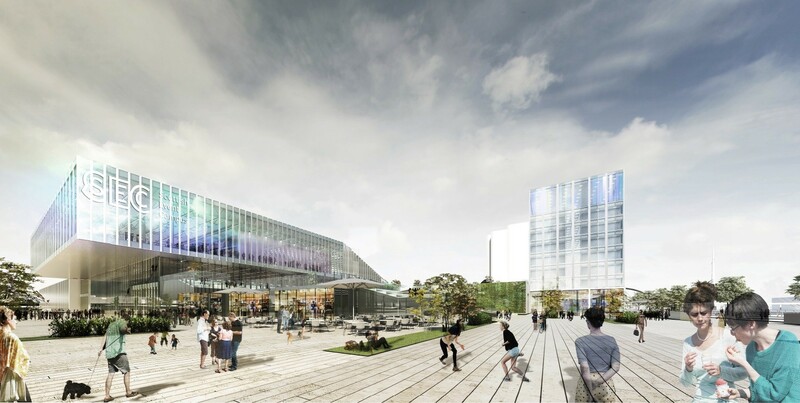 How for example to we increase the permeability of the site- at present dominated by surface car parking & like much of Glasgow planning, car centred- and facilitate walkability for the pedestrian by creating a welcoming psyhco-geography through design for the Campus? Has this vision achieved any of that? On first glance, probably not. Its the job of public bodies & of course the council, to enforce permeability onto the designs of corporate, essentially 'private' spaces, & make such sites integrated into the commons & wider urban realm of the city fabric. Personally I hope the council intervene to act as a corrective to a sprawling fragmented private space already too disconnected as it is- maybe they can contribute those suggestions that will serve as a remediation to elements of poor urban design in the plans. Fantastic brave idea, but let's compare to Frankfurt which will be one of its competition. 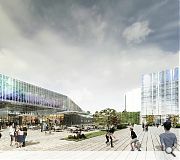 10k hotels rooms within walking distance; suburban train station, underground and tram stations on grounds. hub airport 15 minutes drive... All these things are much more difficult to provide. This will be another welcome change in this part of town. The hydro is driving visitor numbers and this could boost that further. Looking really good and welcome addition to existing structures. Next move to swap ground level parking fields with ore multi-storey structure and fill the gaps with hospitality premises. Ground level pubs/restaurants would add a lot of footfall to the area too. Big miss on the central spine / atrium. Desperately needs consistency and scale to offer the central feature and consistency missing from its current set up. Needs to make a statement and also offer a proper entrance -- specifically at the eastern end -- to the whole central complex. The current design lacks consistency and scalability -- too fussy and too much of a contrast to what is already there. If we want to get things moving then we need to go big -- replicate their Hall 3 or Hall 12. That is a double-decker arrangement for a total of 35K m2 of exhibition space -- column free on the second level. This would then help to scale a new central spine plus allow a balcony arrangement for views over the River Clyde. Site the hall to the north of the central spine and use the space to the south as the new plaza. Surely this would be a better use of public funds than the Avenues project that is a secondary issue at best. What would £115mill deliver at the SEC(C)? Primary use of public funds -- Build productive infrastructure. Secondary use / extra revenue from new infrastructure -- Beautify the city. The Festhalle Messe in Frankfurt does have a superior location between the west end & city centre, hence the convenience of its transport infrastructure- but the stats for the Hydro are off the charts: in 2017 it was 4th in the world, only behind the 02. Manchester & MSG- that's impressive & truly world class. Its a global arena, no question. The Frankfurt question only highlights the need for an improvement in infrastructure AND better integration of the campus to the rest of the city- can it be done without investment in transport? The numbers for the Hydro don't even take in the SECC or the Armadillo & with further expansion we're looking at the Campus being the largest in Europe & probably becoming the most attending in the world- but does that make it the best experience for those attending? Does it make it the easiest to access? Does the design enhance the enjoyment of the visit? These are different questions entirely. New flowerbeds and pavements vs upgraded railway stations? The Argyle lines need upgrading specifically Partick to Dalmarnock with special attention needed at "Exhibition Centre" including the horrible red tunnel. Regarding the Hydro -- no matter the number of people who attend they are being short changed by the local facilities. Huge amounts of money being spent off-site. If the SEC(C) build it -- or at least sell of the plots -- they will come. SEC(C) = 25K m2 approximately of exhibition and breakout space. 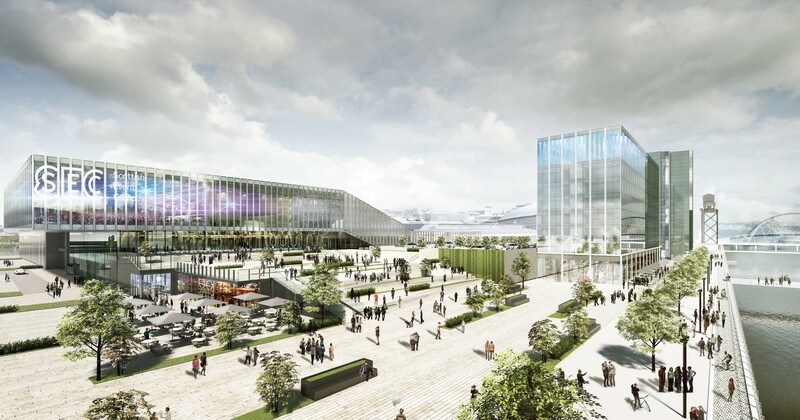 A new double decker hall in the form of Frankfurt's new Hall 12 would increase this area by nearly 150% -- would that be a realistic next step? Better connections at the western end to engage with other local facilities and provide a route to Argyle Street. New link to the train station. More engagement with the south bank -- outside concert bowl in the last of the GF grounds? Public square with a roof -- 15m head height. Plus push for a better train service and a station upgrade. The plans suggests that one full height hall will be expanded and there will be some additional breakout / low height space plus a tidy up around the hotel. Not sure what the budget is but it would appear to be an unfocused tidy up and not the step change that would transform the exhibition offer. Then there is the associated transportation report that points to no planned increase in the footfall after the changes have been made. Secondly could the analysis behind the report be any worse? The report gives the impression that it was phoned by a work experience student who had bigger fish to fry. Absolute tripe from start to finish. The base numbers are all over the place. 7 year averages followed by single year numbers -- the only trend relates to the train station and very little is made of it. Main point seems to be that the SEC(C) cannot walk and chew gum at the same time.